Those of you whom have followed me for years know that I swear by Olio Lusso, Dr. Colbert and Rodan + Fields as my skincare regimen. Yet, as a beauty editor I am always open to sampling new skincare items. 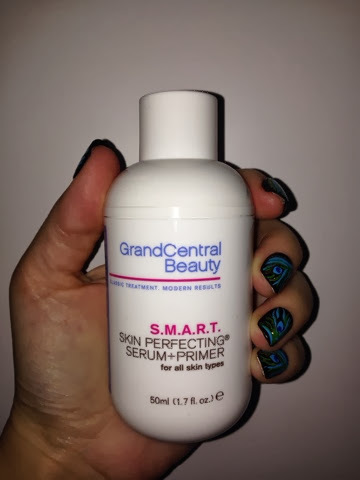 With that being said, this newly launched item from GrandCentral Beauty ($ 68) S.M.A.R.T. Skin Perfecting a Serum + Primer is now available at Henri Bendel's, NewBeauty at Fred Segal, select apothecaries, www.birchbox.com and www.grandcentralbeauty.com . It was created to smooth, moisturize, address anti-aging, redness- reducing and tone the skin-hence it's name S.M.A.R.T. I applied it to my clean skin and it immediately felt smoother skin and I also saw the difference in being more moisturized and hydrated. It is Paraben free, Petrochemical free, Sulfate free, Mineral Oil free and has no harsh scents. It can be used as both a primer and a moisturizer and I look forward to hearing lots of great things from you as I am going to do a GIVEAWAY! Tell me why you need a product that moisturizes, smoothes, keeps your make up on longer, makes your make up set better and I shall choose a winner and announce it next Sunday!